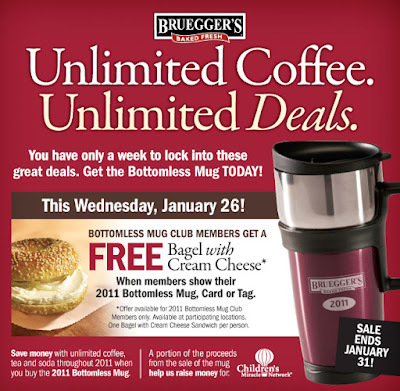 The Messie Kitchen: Bruegger's Promotion For You Bagel Loffers. 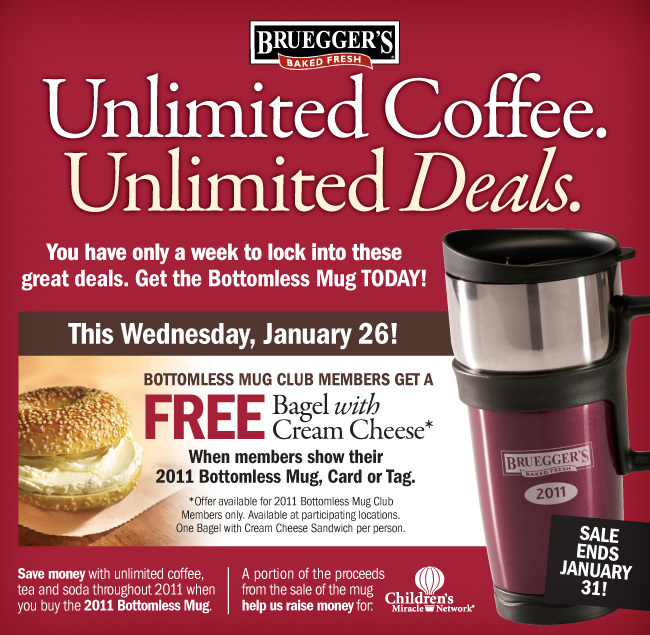 Bruegger's Promotion For You Bagel Loffers. So I'm at work and there's a snow storm going on outside. Technically, if the Fairfax County School system is closed, I'm supposed to be scott free, but when you work earlier than the call is made, you're kind of stuck. So I'm here. And I wanted to tell you all, because many of you will have off work today (if you're local) that you should head out to my favorite little bagel chain, Bruegger's, because they're having a promotion that I think is pretty neat. WHAT: Bruegger’s guests and good neighbors have just one more week to give back to Children’s Miracle Network AND get unlimited refills of coffee, tea or soft drinks throughout 2011; as Bruegger’s national fundraising campaign benefitting Children’s Miracle Network will end January 31, 2011. In Fall 2010, the bagel chain, with 300 locations in 26 states, pledged to donate a portion of proceeds from sales of its popular Bottomless Mugs to benefit children’s hospitals through Children’s Miracle Network. Guests who purchase a Mug receive unlimited free refills of Bruegger’s coffee, tea or soft drinks through 2011 – and help the sick and injured children of their community. To incentivize guests and meet its fundraising goal, Bruegger’s is offering a free bagel and cream cheese to those who purchase a mug on or before January 26. Current Mug holders can also redeem the offer. To date, Bruegger’s has raised nearly $75,000 for Children’s Miracle Network. The company hopes to meet its fundraising goal of $100,000 by January 31. WHEN: Guests who purchase a 2011 Bruegger’s Bottomless Mug will receive a free bagel and cream cheese on January 26 -- and give back to a worthy cause. Bruegger’s fundraising campaign ends on January 31, 2011. WHERE: Nearly 300 Bruegger’s bakeries across the country. For a full list of bakeries go to http://www.brueggers.com/about-us/bakery-locations. February 8: Bruegger’s Birthday Bash. Every bakery in the country will offer three free bagels until 2 p.m. Coupon is required and available through Bruegger’s “Fresh News” email club http://www.brueggers.com/contact-us/email-signup or on Bruegger’s Facebook page, http://www.facebook.com/Brueggers.